Almost everyone relies on some form of transportation every day. And while most of the time we arrive at our destinations safely and without incident, we all know there is a possibility we will be involved in a motor vehicle accident at some point. According to the U.S. Department of Transportation’s National Highway Traffic Safety Administration (NHTSA) there were 37,461 deaths caused by motor vehicle accidents in 2016, and the National Safety Council estimates those numbers topped 40,000 in 2017. In addition to the large number of deaths resulting from motor vehicle accidents each year, millions of people are seriously injured because of an accident. PTSD, short for post traumatic stress disorder, is a mental health disorder occurring in a person who has been traumatized by some event. While PTSD is most commonly associated with veterans of war, any traumatic event, including single incident traumatic events such as car accidents, can lead to the development of PTSD. In fact, according to the American Psychological Association, motor vehicle accidents are the leading cause of PTSD within the United States. What symptoms of PTSD can be caused after a car accident? After being involved in any car accident, it is important to seek proper medical care immediately, even if you don’t think there is anything wrong now. What causes symptoms of PTSD to occur after a car accident? All research agrees the amount of emotional support available to someone after experiencing a traumatic event such as a car accident is crucial factor in their risk of developing PTSD because of the traumatic event. It is important to seek proper emotional support after being involved in such a traumatic event. The skilled New Jersey accident lawyers at Brady, Brady, & Reilly, LLC have been fighting to protect the rights of clients injured in automobile accidents for more than 50 years. 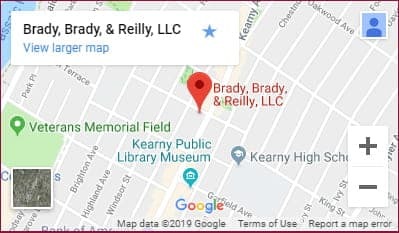 Our office is conveniently located at 377 Kearny Avenue in Kearny. Contact us today to discuss the details of your case and let our experienced car accident lawyers advocate for you to receive the maximum compensation you need and deserve. Call us at 201-997-0030 or contact us online for your confidential and free consultation. We are able to meet with you in our Kearny office, at your home, or in the hospital. We look forward to speaking with you.